In a decision likely to have a major impact on insolvency proceedings, the Chennai bench of the National Company Law Tribunal (NCLT) has said that any lender with vested interest in, or having relations with, a corporate debtor should not be part of the committee of creditors (CoC) in a resolution process. The Tribunal held that the second respondent, Anandcine Services, is a 'related party', which would have no right of representation, participation or voting in CoC meetings. The first respondent in the case was the Insolvency Resolution Professional (IRP). Excellent. This would prevent the corporation from influencing the discussions at the meetings. The much-hyped loan in 59minutes scheme announced by prime minister Narendra Modi on Diwali last year has been found providing loans for less than 50% of applicants, reveals replies received under the Right to Information (RTI) Act. In fact, Indian Bank has rejected as many as 77% of applications that had received in-principle approval from the psbloansin59minutes.com portal. Even State Bank of India (SBI), the largest State-run lender, has rejected as many as 48% applications it received from the portal specifically set up for fast processing of applications and giving in-principle approvals. According to information received from Allahabad Bank, Andhra Bank, Bank of Baroda, Bank of Maharashtra, Canara Bank, Corporation Bank, Indian Bank, Indian Overseas Bank, IDBI Bank, Oriental Bank of Commerce, Punjab and Sind Bank, Punjab National Bank, SBI, Syndicate Bank, UCO Bank, and United Bank of India, these lenders received 45,161 applications from the 59minute loan portal. Out of these, banks granted loans to 21,584 borrowers or 48% borrowers. 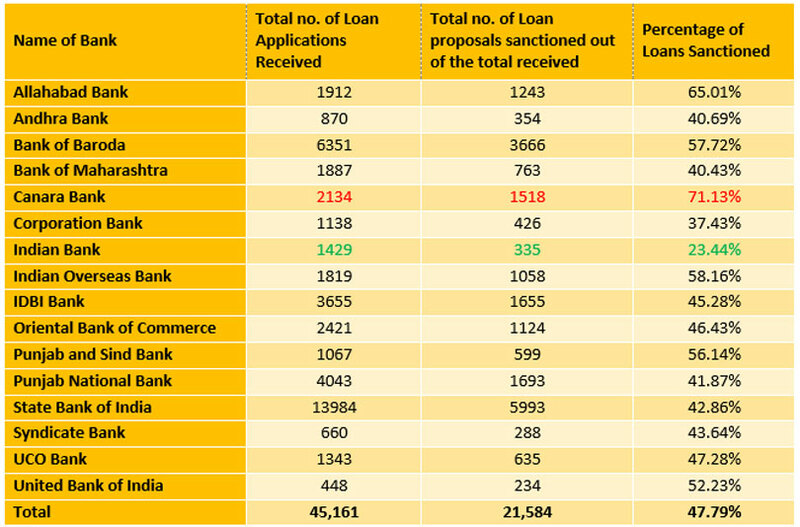 Total loans sanctioned by these banks so far under the scheme is Rs6,606.34 crore. Considering the total number of borrowers, who were granted the loan, the average ticket size of the loan comes to Rs30.6 lakh. From the borrowers perspective, Canara Bank seems to be a good bet to get the loan. Canara Bank received 2,134 applications out of which it sanctioned loan to 1,518 borrowers or 71% of the applicants. On the other hand, Indian Bank turned out to be more cautious and had rejected 77% of applications. As per the RTI reply, Indian Bank received 1,429 applications, out of which it granted loan to just 23% or 335 borrowers. As expected SBI, with its huge spread across the country, has provided loans of Rs2,198.77 crore as on 15 March 2019 to 5,993 borrowers. This number, however, is much lower than the total number of applicants which stands at 13,984. In other words, SBI has sanctioned loans to only 43% applicants. Bank of Baroda (BoB), with sanctioned loans worth Rs1,012.1 crore stands at the second spot after SBI, in terms of amount of loan granted under the scheme. BoB had received 6,351 applications from the portal and had sanctioned loans to 3,666 borrowers. This means only 58% of applicants have received loan from the Bank. Dena Bank, in its reply to the RTI application stated, "(The) Reserve Bank of India (RBI) has imposed credit embargo on 8 May 2018 on the Bank. (Dena) Bank has not done any fresh lending since then and has not participated in the 59minutes online portal." While the pitch for the loan in 59minute scheme was that anyone can get a loan in less than 60 minutes, all the borrower could get is just an in principle approval for submitting required documents. CapitaWorld that operates psbloansin59minutes.com portal clearly says the loan eligibility is determined by income, revenues, repayment capacity, existing credit facilities and any other criteria set by the lenders. All the portal does is collect documents, analyse correctness and authenticity of these documents and then give an eligibility letter or in-principle approval for the loan. The prime minister had announced that there would be a dedicated digital platform to enable micro, small and medium enterprises (MSMEs) secure in-principle approval for loan proposals of up to Rs1 crore in just 59 minutes. To enable quick and algorithmic processing of loan, Small Industries Development Bank of India (SIDBI), with help from CapitaWorld, set up psbloansin59minutes.com. Any MSME entrepreneur, who is seeking a loan, needs to fill up forms and provide details on this website. For registration, as psbloansin59minutes.com would like to call this process of collecting all information, there is no fee charged. However, if the borrower wants to receive an 'in-principle approval' he needs to pay Rs1,000, plus the applicable taxes. In other words, while less than 50% of the applicants did not get any loan from the bank, CapitaWorld, received Rs1,000 from each applicant. As per the replies received under RTI, so far 45,161 applications were sent by the portal to banks for loans and the company had collected Rs4.51 crore as fees. The most depressing aspect of the scheme, of course, is that public money from the public sector banks is being used again by politicians to dole out money under the garb of helping MSMEs. Even if the borrower does not have collateral security, he/she can avail business loan through www.psbloansin59minutes.com under Credit Guarantee Fund Trust for Micro and Small Enterprises (CGTMSE) scheme. Please note, it is as per the lender's discretion and the lender can ask for collateral as per the latest guidelines. This means since loans under the 59minutes scheme are fully guaranteed by CGTMSE, banks have no responsibility to recover the loan. Good look behind the curtains of a scheme launched with publicity. Coming to the findings, 40 percent pass thru is a very good implementation - in the context of how government schemes usually remain only on paper. Didn't understand the distressing part. If it is a policy guideline to guarantee the loans by a government agency - for those not having collateral - I don't find any fault. Seems equivalent to so many dole out, concessions, targeted tax rates to stimulate specific sections of population / specific sectors. Also if 50+ percent applications are getting rejected - it shows banks are exercising some diligence, and not giving to all and sundry. What about reliance Dasault venture at primiume 1100 % tax paid ? Find out who's loan's passed are connected with any political party's or sangathan ?